South Africa is a popular place to retire among many Europeans and especially Brits. It is estimated that over 200,000 people from the UK have retired to South Africa, mostly in Johannesburg and Cape Town., but also along the southeastern coast. People retire here for the moderate year round weather, outside recreation, and stable government. South Africa is a parliamentary democracy. While in many ways it is a developed country, much of its population lives in poverty. All major urban areas have modern, world-class hotels and tourist facilities. Food and water are generally safe, and a wide variety of consumer goods and pharmaceuticals is readily available. The capital is Pretoria, while the seat of parliament is located in Cape Town. Johannesburg is the financial capital and largest city in South Africa. Durban is home to Africa’s busiest port and is the number-one domestic tourist destination for South Africans. 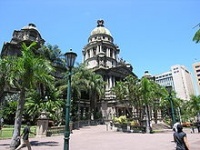 (Pictured below: colonial building in Durban). Crime and Security. Organized or wildcat labor strikes occur regularly in South Africa. Service delivery protests also occur frequently and are generally motivated by poor residents’ frustrations with shortfalls in public service deliveries. According to the U.S. State Departmetn the vast majority of visitors complete their travels in South Africa without incident. However, visitors should be aware that criminal activity is prevalent throughout the country and can be violent. The South African government has in place a number of strong anti-crime initiatives, but violent crimes, such as armed robbery, carjacking, mugging, "smash-and-grab" attacks on vehicles, and other criminal acts are still common and do affect visitors and resident U.S. citizens. There are reports of organized crime gangs targeting individuals and commercial businesses at shopping centers and other public places. Once a victim has been identified, he/she may be followed back to his/her residence or hotel and robbed. Many wealthier people and expats live in gated communities for protection. Weather. The Mediterranean climate is generally mild except in the northern and mountainous areas of the country. Medical. US Medicare is not honored in South Africa. Private medical facilities are good in urban areas and in the vicinity of game parks, but they may be limited elsewhere. Pharmacies are well-stocked, and equivalents to most American medicines are available. U.S. citizens should not assume that their insurance will cover them when they travel. It is very important to find out BEFORE you leave whether or not your medical insurance will cover you overseas. Cost of Living. The numbeo.com price comparison (CPI plus rent) shows South Africa with a very favorable index of 24, vs. the U.S. with 60 and UK at 73. The Local Purchasing Power Index shows (a questionable) 126 for South Africa vs. 120 for the UK and 139 for the U.S. The average mid-sized home sells for about $100,000 or 73,000 £. The value of the Rand has been steadlily declining, converting at .061 to the U.S. Dollar in 2016. Taxes. Temporary residents are taxed on their South African income and permanent residents are taxed on their worldwide income. The progressive income tax starts at 18% and goes up from there. There are provisions to prevent you from having to pay double taxation. Best Places to Live. See the list of the South African cities we have reviewed in the top right hand column. Many retirees prefer to live in cities popular with expats such as Cape Town and Johannesburg. Cities have plenty of attractions and living options, although they will generally be more expensive. The Garden District along the southeast coast offers many nice towns and resorts for a lower key experience. Cities and towns for which we have reviews are listed on the right sde of this page. Durban is a city of 200,000 with great beaches and access to tourist areas. Knynsa is a popular place for UK residents to retire. It is located in the Western Cape area and is on the Garden Route. Pluses and Minuses. South Africa is a cheaper alternative than the UK and France. The weather is warmer than most of Europe. The weather and the scenery and lifestyle are definite plusses. The violent crime that most expats are not exposed to is a concern. So is the disparity between the rich and the poor, which can be overwhelming if you leave the wealthier enclaves.